When a board game is presented as a math game, I am always eager to try it out! Unfortunately, in many cases I find the math in these games are too straightforward with cards of math problems for players to solve, or numbered spaces to count. 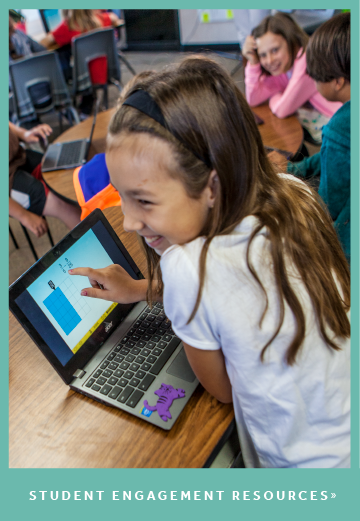 These games are usually far from fun, only allowing kids to practice math facts or formulas. They lack the opportunity for the player to choose from different actions, strategize or even plan ahead. The math in board games doesn't have to be so straightforward! Math is not just about numbers and formulas, and games is one way we can experience the beauty of math all around us. There are many fun board games that integrate deeper mathematical thinking into the gameplay. 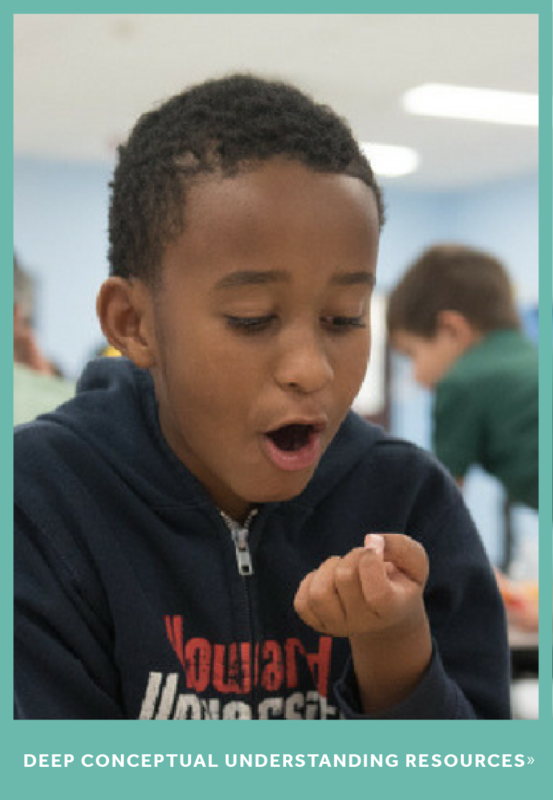 These games help students develop skills such as multi-step problem-solving, spatial reasoning, pattern recognition, resource management and much more. Here's my list of go-to board games for engaging students in math through games. I've arranged them loosely by recommend ages, but many of these games play great whether your students are six years old or seventeen years old (for example, Tsuro). Achi is a game played by the Asante people of Ghana that is similiar to tic-tac-toe. However, where tic-tac-toe ends when all the pieces have been placed, Achi continues as players move their pieces to adjacent spaces until a 3-in-a-row is formed. Download the free printable board game from MIND Research Institute! You can also find the storybook board game version with even more math in MathMINDs Games: South of the Sahara. Math connections: Achi is structured to naturally lead to questions that can be resolved through logic and deduction. Explore the history of Achi and its math connections in MathMINDs Games: South of the Sahara. Robot Turtles is a quick, fun and fast game which teaches programming fundamentals. The older student, or adult, as the "turtle mover" provides informative feedback by moving the players' turtles according to the actions each player chose. Another neat thing about this game is that you can start very simple and in the next games add elements to make it more challenging. Math connections: rotation, multi-step problem solving, computational thinking. Qwirkle is a sequence creation game. Players play a sequence of tiles that match in either shape or color to score points. This game is very quick to learn and play! Math connections: Shape identification, counting, addition. 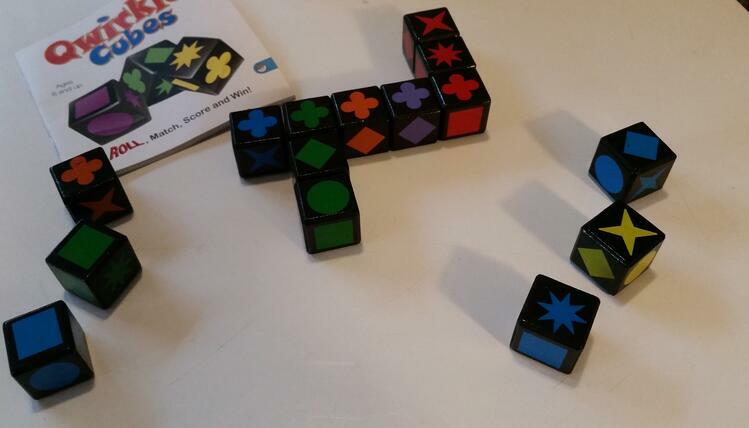 Qwirkle (Cube version shown) is great for practicing shape identification! Ice Cool combines two of my favorite things: penguins and geometry. Players flick their penguin piece across the board and through doorways to collect fish, or chase other players. Students develop fine motor skills as well as an understanding of angles as they maneuver their piece around the board. Math connections: geometry, measurement and estimation, counting. 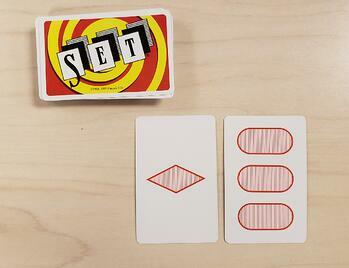 Set is a time-based set collection card game. A set is a combination that is all alike or all different in all categories: shape, number, pattern/shading, and color. The game is very visual and language-free, which is great for English learners or other students with communication challenges. The flexibility in number of players and ways you can play make it great as a filler or early finisher activity. For younger ages and for travel, there is a mini-version of the game with only 3 categories. 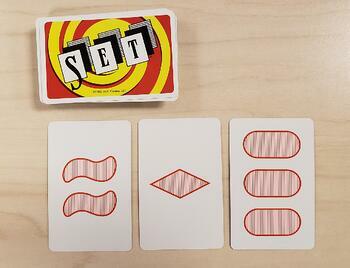 Set cards can also be used to create math talks or puzzles for a quick warm-up activity. 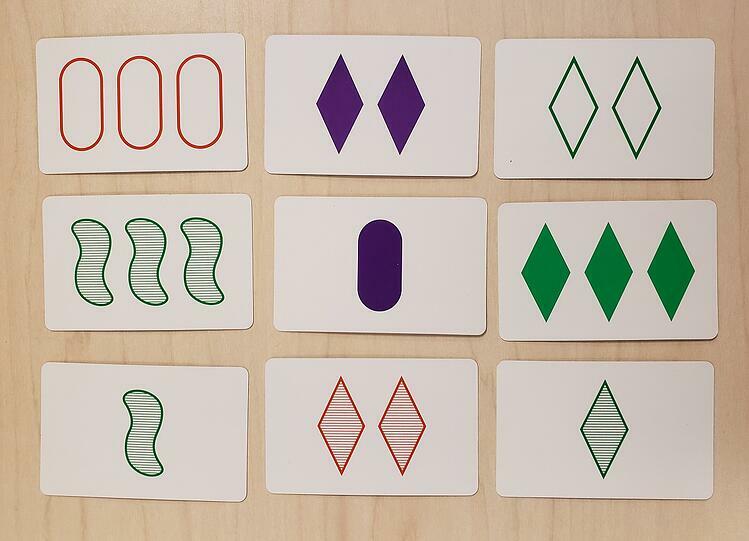 Answer: Both cards are shaded, so the card must be shaded. One is a 1, and the other a 3, so the third card must be a 2. One card is a diamond, and the other an oval, so the final card must be a squiggle. Both cards are red, so the final card must also be red. How many sets can you find? In Tsuro, players take turns placing tiles, which create paths for the player to follow, some of which may lead off of the board. The object of the game is to be the last player on the board. No two tiles are alike, which is in itself a great math question. "Place a tile and follow the path" is an easy enough concept for younger players to understand, and older players will be able to strategize about which card to play and where to move on the board to control more of the space. Math connections: Multi-step problem solving, spatial reasoning, patterns, graph theory. 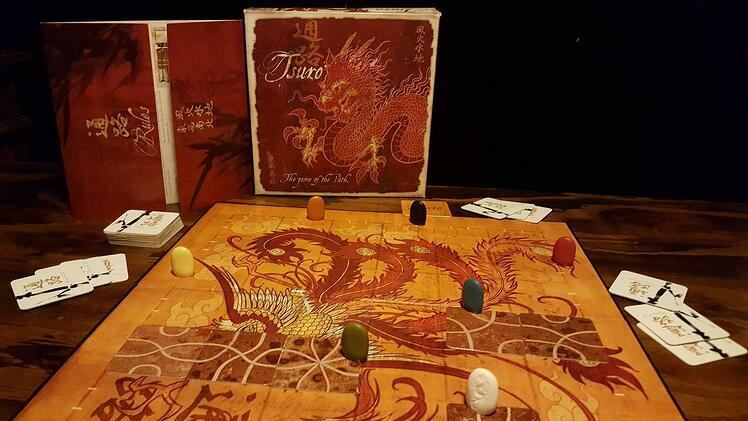 Tsuro is a tile-placement game in which players can develop spatial reasoning as they visualize how their piece will move along the paths. This centuries-old game is traditionally played by the Dakarkari people in what is now the Sokota State region of Nigeria. Players take turns placing their pieces on the board, then move pieces in an attempt to form rows of three. When a player forms a row of three, they get to remove one of the opponent's pieces. Download the free printable board game from MIND Research Institute! 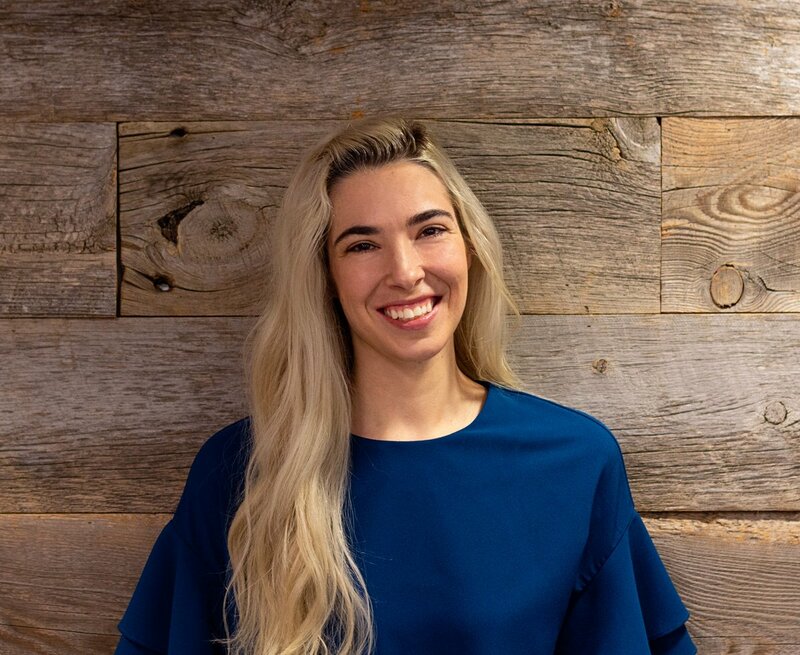 Math connections: Dara is an ancestor of chess, sharing a focus on deductive reasoning and multi-step problem solving. Players add notched wire pieces to build a shifting sculpture that appears to always be just hanging in balance. There are multiple ways to play, making it great for a range of ages. This game is simple but exciting, because at any move the whole structure could collapse! Math connections: Symmetry, equal parts, physics. Players build train tracks across the United States, attempting to complete their unique tasks for bonus points. The strategy is in choosing which routes to take, jugding which bonus cards to target and reacting to how your opponents place. Math connections: Multi-step problem solving, resource management. 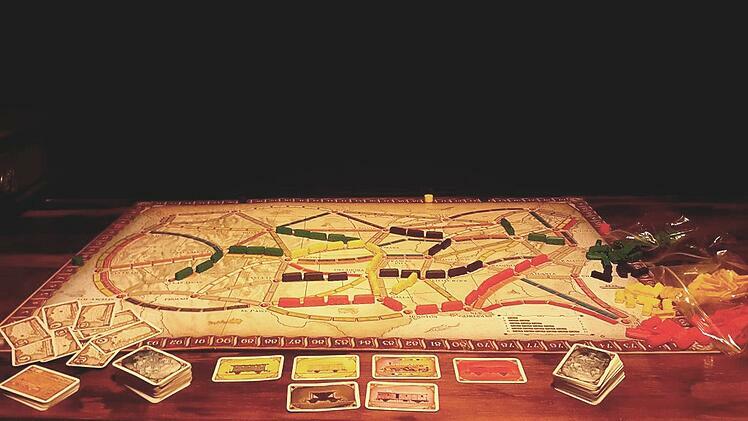 Ticket to Ride develops planning skills as players must think ahead on how to complete their objectives. 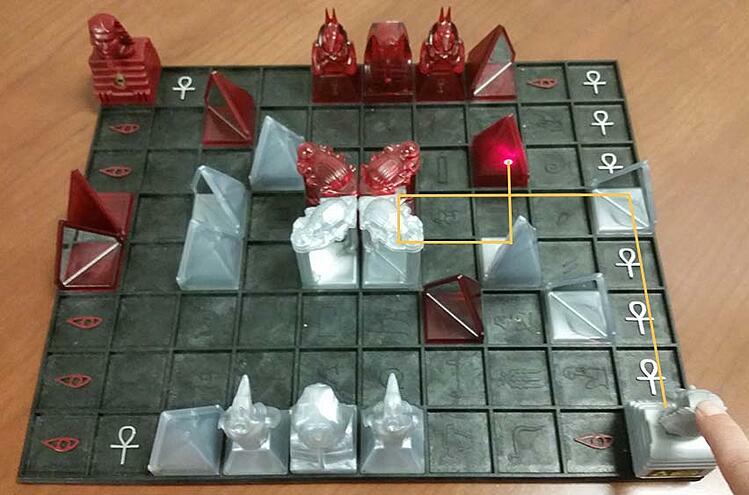 Khet is similiar to a laser version of chess, where players must rotate and move mirror pieces and blocking pieces to get their laser beam to hit the other player's pharoh while protecting their own pharoh. When players move or rotate a piece, they end their turn by pressing their laser beam. The informative feedback helps players determine their next moves. Math connections: Rotation, angles, reflection and refraction as well as multi-step problem solving. Khet Tip: Use a piece of white paper to see where the laser goes when it doesn't hit a piece. 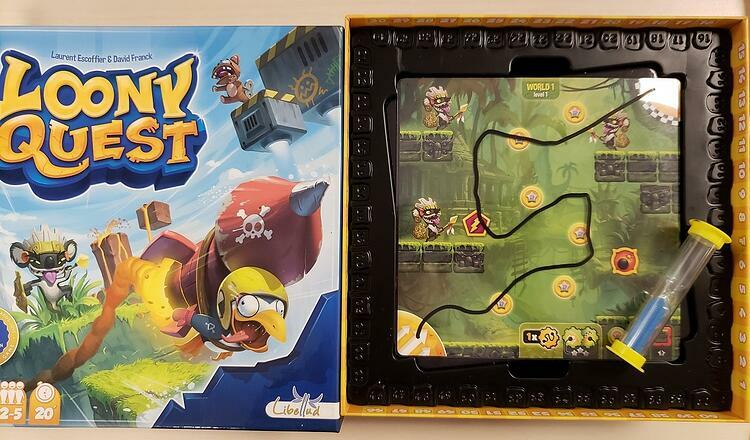 Loony Quest is a drawing game where players study the level card for a short time and draw a path on their own transparent sheet. After the time runs out, players take turns overlaying their transparent sheet onto the board to see how well they did. Players get bonuses (depending on the card) for things like grabbing coins and keys, and completing the objective, and lose points for hitting obstacles or enemies. The level cards look like video games, which is very appealing to kids. Players have to use spatial reasoning to visualize the path and draw where they need to go on the board. The time forces players to estimate and move quickly, though for students with fine motor difficulties you could add time (two turns) or do away with the timer. Math connections: spatial temporal reasoning, estimation, time management. Checking a player's estimated path in Loony Quest. In Ricochet Robots, players must figure out how to get the robot to a particular spot on the board in the lowest number of moves compared to your opponents. Once someone thinks they have a solution, they say the number of moves they will use. The timer starts for the rest of the players to say their number if they think they have a solution with fewer moves. There are multiple solutions to every problem, and every game is different. This game also helps build working memory, as you must visualize your solution and remember it even while others try out their own solutions. There's also an online version of Ricochet Robots, but it is a solo version. Math connections: Patterns, algorithms, working memory. This quick card game has limited rules: on your turn you draw a card and play a card. The goal is to get to the princess, but the deck is stacked with all kinds of other characters who can help and hinder you. Since there are only 16 cards, it is a great exercise in memory and deduction, as players try to eliminate other players and find the princess. There are also many different themed versions of the game, including Lovecraft, The Hobbit, Batman, etc, that you can find one that resonates with your students. Math connections: logic and deduction, memory. 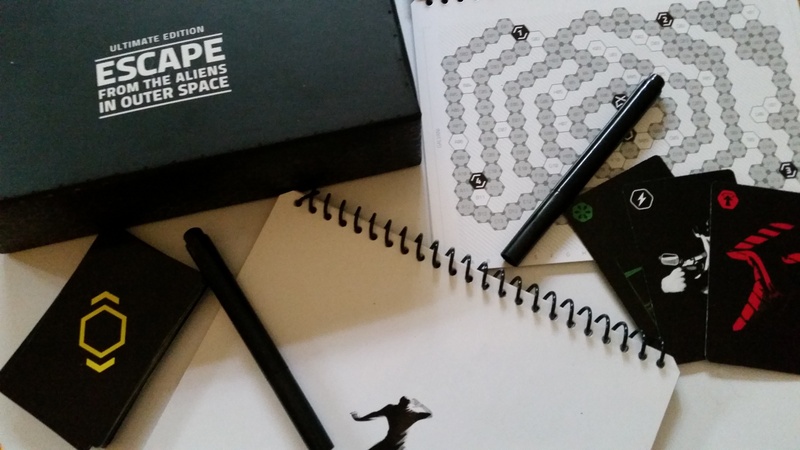 Not only is Escape From the Aliens in Outer Space a fun theme that students will enjoy, it really tests your students' abilities to think logically. Each player has their own map and dry erase marker, choosing where they will move on the map then drawing a card that determines if they state their location or lie about their location to the group. Depending on if they are a human or alien, the player must escape or prevent escape to win. If students are listening and tracking, they can absolutely deduce where the other players are located on the map! A print and play version is available for a small fee. Math connections: logic, pattern recognition, deduction. Players hide their movements while trying to deduce and track where other players are moving. Splendor is a turn-based strategy game. Players collect gems and cards each turn, generating combinations that garner them extra points. After one player hits a certain amount of points, the player with the most points at the end of the round wins. Math connections: resource management, multi-step problem-solving. Five Tribes is an updated and expanded version of Mancala. Players move colored meeples (board game pieces) in a similar fashion to Mancala, picking up a group and dropping one meeple at a time as they move around the board, then performing an action on their final space. There are many ways to gain points in this game, including claiming spaces, gaining abilities, and collecting resources. Players also have an opportunity to bid to go first, which allows players to risk a certain amount of points to gain possibly more points. Math connections: spatial reasoning, resource management, multi-step problem-solving. 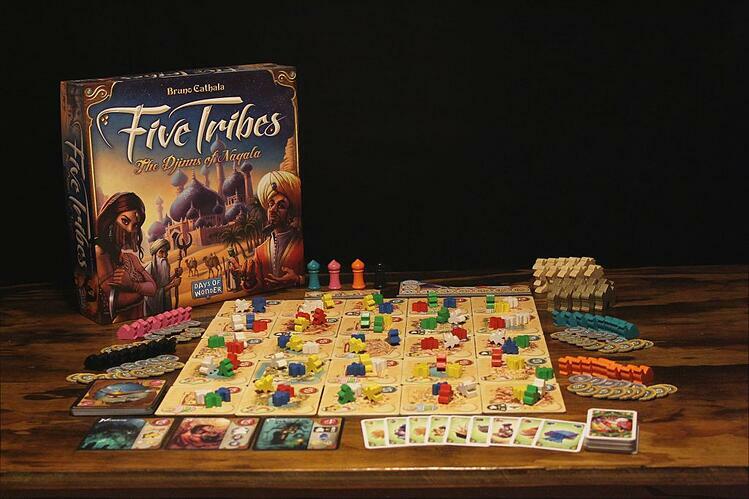 Five Tribes helps players think through several move options as they visualize possible moves. Sagrada is a turn-based strategy game where you are building your stained glass mosaic using colored dice. However, you must follow certain rules for building (for each adjacent piece, the color and number must be different than those surrounding it) in addition to the rules on your individual building plans. Depending on how and where you add your dice, you can make it easier or more difficult for yourself. This is where looking at probability comes into play, so you can make it more likely that you’ll be able to build each turn. In addition, there are bonus points from cards (they change each game) - so players need to weigh which dice and placement will net them more points. It’s also a great game to build productive struggle and learning from mistakes, because you get much better the more you play. It’s competitive, but you can also play to beat your personal score each game. Math connections: Multi-step thinking, pattern recognition, logic and deduction, number sense, probability. These games have been mentioned to have math connections, but I found that the math was not quite integrated well into the strategy and gameplay (for example, just practicing math facts), or the gameplay did not make enough deeper math connections for me to consider adding it to the list. Please note, this is just my opinion and that doesn’t mean that these games don’t have merit for educational play. I hope this list helps you get started building your own library of math board games and help facilitate tons of interesting math discussions! Did I miss any of your favorite board games? Please let me know on twitter! Don't forget to check out our box of storybook board games, MathMINDs Games: South of the Sahara! Please note, some links direct the user to the product on Amazon Smile, where you can set your charity of choice to MIND Research Institute and support math education through your purchase. Thank you for joining us on our mission to ensure that all students are mathematically equipped to solve the world's biggest challenges. Board game photography on this page by Unfiltered Gamer.